Background: Paracentesis is a common bedside therapeutic and diagnostic procedure that requires insertion of a catheter into the peritoneal cavity; however, lack of a specialized fixator for securing the catheter causes frequent catheter kinking and patient discomfort. Objectives: This study aimed to demonstrate the efficacy of a designed paracentesis fixator in reducing patient discomfort and procedure failure rates. Materials and Methods: This interventional study was conducted on 20 patients referred to Imam Khomeini General Hospital for therapeutic paracentesis. A fixator was used to secure the catheter in the experimental group. This designed fixator consisted of an inverted plastic cup with six square-shaped appendages, a cylinder-shaped tube, a flexible silicone hose in continuation of the cylindrical tube, and a connector piece. In the control group, catheter was fixed using tape and sterile gauze. A questionnaire regarding subjective discomfort and overall satisfaction was filled by patients after the procedure. Results: Mean score for subjective discomfort was significantly lower (P = 0.03) and patients’ overall satisfaction was higher in the experimental group (P = 0.04) in comparison to control group. Failure occurred in 20% and 70% of patients in the experimental and control groups, respectively. Coclusions: The designed paracentesis fixator effectively secures the catheter, reduces catheter kinking incidents, and improves patient's comfort and satisfaction. Paracentesis is one of the routine procedures performed in many clinical situations including relieving the pressure from ascites in patients with end-stage liver disease or cirrhosis. About 85% of patients with ascites in the United States have cirrhosis (1) and in 10% of cases ascites occurs due to malignancies (2). Approximately 50% of patients with compensated cirrhosis develop ascites during a ten-year follow-up (3), which is the most common complication of cirrhosis leading to hospital admission (4). Paracentesis aids in determining the etiology of the ascites (5) and as a therapeutic modality, provides temporary relief (6). One of the major drawbacks of performing paracentesis in Iran is lack of a connector piece for connecting the catheter to the collecting container, which is usually a urine bag. 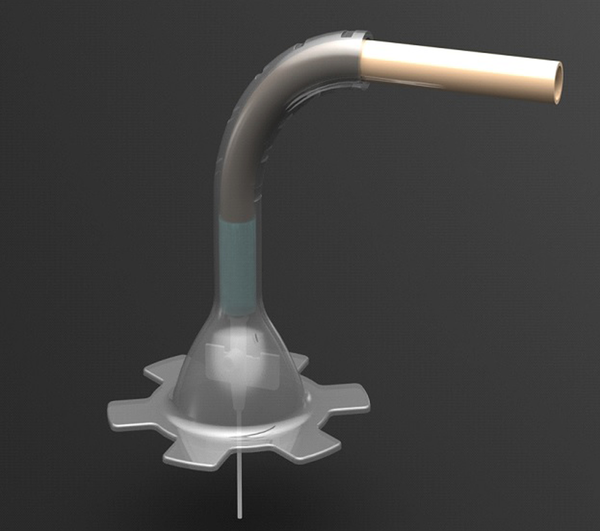 At present, in most clinics and hospitals, physicians remove the plunger from a 2-mL syringe and use the barrel as a connector, with the tip of the barrel connected to the distal end of the catheter and the end of the barrel connected to the draining urine bag. The problem with this technique is the instability of the connection, which may result in detachment of either parts and failure of the procedure (1). Another problem with this technique is fixing the catheter and the attached connector in place. Currently, sterile gauzes and surgical tapes are used for this purpose; however, this attachment is unstable and drainage of more fluid into the urine bag and its increasing weight cause the catheter in the peritoneal cavity to be displaced, and consequently, the fluid outflow will be disrupted. Since any sudden movement can displace the catheter, the patient must remain motionless for several hours, which can be inconvenient. Moreover, using a bulk of surgical tape to secure the connection may cause allergic reactions in some patients (3). The purpose of this study was to compare our designed fixator for catheters used in paracentesis, thoracentesis, and lumbar puncture with the traditional method and to evaluate its efficacy in reducing patient discomfort and procedure failure in a small sample of patients. This pilot study was conducted on 20 patients who had undergone elective therapeutic paracentesis at Imam Khomeini General Hospital, Tehran University of Medical Sciences, Tehran, Iran. Patients were allocated to experimental and control groups. The details of the study and possible risks were explained to each patient and a written informed consent was obtained from each patient. The designed fixator was registered at Industrial Property General Office with registration number of 82948 as a patent. Patients who had ascites from cirrhosis or malignancy and needed therapeutic paracentesis were included. Patients with coagulopathies, thrombocytopenia, bladder distention, bowel obstruction, or abdominal wall cellulitis were excluded. After finalization of patent drawings at the research Center for Biomedical Technologies and Robotics, the prototype device was manufactured using a 3D printer. The designed fixator consists of the following parts: an inverted cup made of transparent plastic with six square-shaped appendages, a cylinder-shaped tube at the distal end of the cup, and a flexible silicone hose in the continuation of the cylindroid tube. The cylindroid tube was positioned vertical to the inverted cup and enclosed the connector piece. The connector piece was shaped like the top half of the barrel of a 2-mL syringe (Figure 1). After preparation and positioning of the patient, lidocaine solution was injected along the catheter insertion tract for anesthesia. Upon selecting the entry point, a 16-gauge catheter was inserted into the peritoneum. The catheter was advanced over the needle and into the peritoneal cavity until the ascitic fluid outflow became evident. Then, in the control group, the inserted catheter was connected to the barrel of a 2-mL syringe which was attached to the urine bag and fixed using sterile gauze and surgical tape. In the experial group, first, the connector piece was inserted into the cylindroid tube at the top of the cup and the distal end of the silicone hose was attached to a urine bag. Then the connector was attached to the catheter and the cup encircled the catheter. Finally, the cup was fixed to the abdominal wall using double-sided binding tape. After the procedure, patients were asked to assess the level of discomfort during the procedure using a verbal numerical rating scale of zero to ten (0, no discomfort; 10, highest level of discomfort). Patients’ overall satisfaction was also subjectively evaluated from zero to ten (0, not satisfied; 10, highest level of satisfaction). Repeated procedures due to catheter displacement were also recorded by the physician conducting the procedure. Statistical analysis was performed using SPSS for windows (version 18.0, SPSS Inc., Chicago, IL, USA). Mann-Whitney U test was used to compare groups and P < 0.05 was considered statistically significant. There were four men (40%) and six women (60%) in the experimental group, and five men (50%) and five women (50%) in the control group. The mean age of participants was 56.10 ± 4.53 years and 54.10 ± 5.68 years in the experimental and control groups, respectively. The mean score of subjective discomfort was significantly lower in the experimental group than in the controls (3.40 ± 1.50 and 7.10 ± 1.52, respectively; P = 0.03). In addition, mean satisfaction score was significantly higher in the experimental group than in controls (8.0 ± 0.81 and 5.10 ± 1.19, respectively; P = 0.04). Further analysis showed that there was no significant difference between men and women in terms of discomfort and overall satisfaction. Failure of the procedure occurred in 20% and 70% of patients in the experimental and control groups, respectively. The results of this study indicated that patients for whom the designed fixator was used to secure the catheter were significantly more satisfied with the procedure and reported less discomfort during paracentesis. Failure rate due to catheter kinking or displacement was higher in the control group than in the experimental group. Various prepackaged paracentesis kits including safe-T-centesis catheter drainage tray, cardinal health, large volume abdominal paracentesis kit, and arrow international are available in the United States. Some of these devices have a blunt retractable obturator that prevents complications such as organ damage (7). The use of traditional intravenous catheters has been associated with more complications due to the need for multiple punctures and more frequent disruption of the fluid flow (8, 9); therefore their use is discouraged. Richard et al. evaluated the use of the Pleurx tunneled catheter for repeated abdominal paracentesis in patients with malignant ascites; they reported that using this catheter had eliminated the need for frequent attendance in the hospital for repeated paracentesis and had provided continuous access to the peritoneal cavity (10). In a study by Lee et al., a commonly used multiple lumen catheter for central venous line insertion was demonstrated to be effective in abdominal paracentesis and thoracentesis. They stated that this technique allows a more rapid fluid flow and eliminates the need for multiple punctures due to flow blockage (11). In Iran, unavailability of specialized kits has forced physicians to use conventional intravenous catheters for paracentesis. Improper securing of these catheters predisposes them to kinking and disrupts fluid outflow. Moreover, multiple punctures increase the risk of infections. The square-shaped appendages in our design provide a stable attachment to the skin and prevent catheter kinking by resisting the increasing weight of the urine bag. Furthermore, the firm attachment of the connector piece to the cylindroid tube at the top of the cup keeps the catheter in its position. Therefore, our designed fixator provides a more stable attachment in comparison to the traditional methods and decreases complications related to the catheter kinking. We concluded that our designed fixator significantly increased patients’ satisfaction and decreased discomfort and failure rates; however, our study was a preliminary investigation to assess the efficacy of the designed fixator in a small sample of patients. Further works are required to establish the efficacy of this device in larger populations. We believe this fixator is a cost-effective device that can reduce iatrogenic complications and can significantly improve patient care. The authors thank Dr. Alireza Mirbaghery for providing well-defined patent drawings. We express our gratitude to the Research Center for Biomedical Technologies & Robotics (RCBTR). Authors’ Contributions: Idea and design: Afsaneh Amouzegar and Sahra Emamzadeh-Fard. Data collection and statistical analysis: Sahra Emamzadeh-Fard. Drafting the manuscript: Afsaneh Amouzegar.